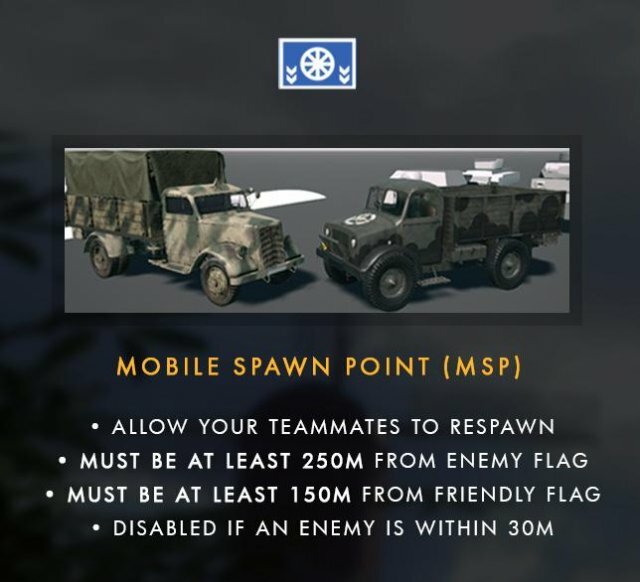 A quick guide on the correct usage of the MSP - Mobile Spawn Point - in Post Scriptum. Want to Effectively Utilise the MSP and Be a Better Soldier? If you're sick of hearing your teammates scream "Move The MSP! ", spending half the game walking across the map, and you're still wondering what this "M.S.P." even is, this guide is for you (and don't worry, we all start somewhere - I had to be told this too). The MSP, or Mobile Spawn Point, is a vehicle that allows your team to deploy closer to an objective than the normal static spawns - making it crucial for reinforcing your team, whether on attack or defence. Mobile Spawn Point trucks and corresponding MSP map icon. On your map, the MSP looks like a little cartwheel in a box, and is coloured either Grey (unoccupied), Blue (occupied by a team member), or Green (occupied by a squad member). You can press M or Enter to view your map and locate your nearest MSP. If you are a Squad Leader ("SL"/"Squaddie") or MSP driver, you can also view a "Red Zone" on your Map - this Red Zone indicates where your team cannot spawn, should you park the MSP there (basically too close to the cap points). Nominally, this Red Zone is 150m from cap points, but enemy soldiers can also negate MSP spawning by being within 30m of the vehicle. Therefore is vitally important to pay close attention to not only the Red Zone, but also the assumed position and advance of the enemy, as not doing so will not only render the MSP useless, it will also place the MSP in imminent danger of destruction, and put all those that spawn on it in the direct firing line. It is important to note that your team can only spawn on the MSP if it is parked, and sitting outside of the Red Zone. Nobody can spawn on the MSP if it is moving! When playing the Offensive game mode, capture points (often referred to as cap points/flags) cannot be retaken when defending - although you can stop and and reverse partial caps if you have more friendly soldiers on the point. As such, the MSP should always sit in the most effective position possible to encourage rapid force deployment and numerical superiority, while ensuring the safety of one of your team's valuable assets. If requested to "move the MSP! ", simply run up to the vehicle, hold F to hop in (this takes a few seconds), press E to start the engine, and drive it to a safer location. If you do not press E and start the engine, the MSP will not move, and you will be a sitting duck. Once you have found a safer location - pressing M to check your map - be sure to turn OFF the engine by again pressing E. You will then hear the engine cut out, reducing the chances that the enemy can locate your nifty new spawn point. Just be sure not to drive around for too long - your teammates cannot spawn on the MSP until you are at a full stop, parked up. As defender, when you have the MSP just outside the Red Zone (on the edge), if the objective turns neutral the Red Zone expands slightly. This can mess up your chances of retaking the point, as the MSP will be invalidated. Make sure to park it a little bit further away than the Red Zone allows to minimise the likelihood of this happening. The Mobile Spawn Point, Forward Operating Base, and Construction Truck. You may also be asked to "move the CT" or Construction Truck (sometimes referred to as "logi"/"logie" or logistical truck), shown above. The same operational techniques apply here too. Don't leave the MSP in positions where the enemy are known to be or will soon advance to. Pay attention to your map and the Red Zones. Do note that your team can't spawn on the MSP if it is moving and/or in the Red Zone. Remember that you can't cap flags on Offensive mode when defending. Ensure you press E to turn on the engine, less you get shot in the face. Don't forget to turn off the engine once done, making it less obvious where you parked. And finally, remember to work as a team and have fun! You only get a few MSP vehicles per map, and they take a long time to spawn in (if ever), so use them wisely, and look after your MSP! Post Scriptum is far from perfect, sure, but she's a beautiful experience. 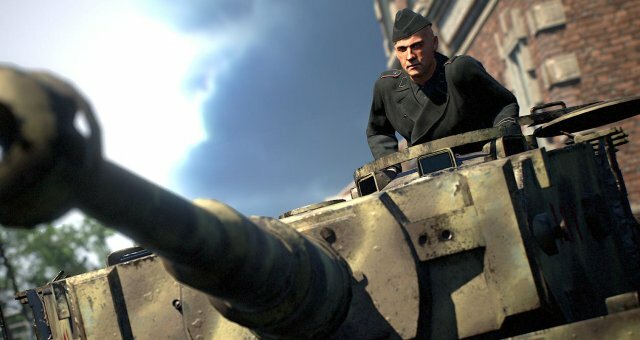 When paired with solid team comms and coordination, the tactical nature of the game, the sporadic intense firefights, and excellent audio (tank shells are my personal favourites) all serves as a blood pumping embodiment of the ugliest conflict in recent history.